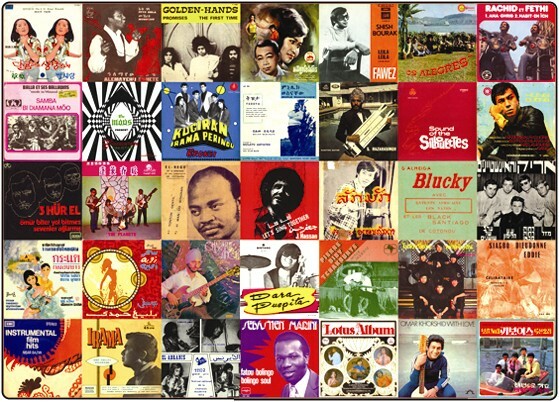 Once upon a time, Stuart wanted to learn more about the "proliferation" of Western influences on popular music from Africa, the Middle East, India and Asia - with a focus on sources from the mid 1960s to the mid 1970s. The original idea - to fulfill something he could share - was not that clear. He started his quest by collecting hundreds of rare songs, slowly slowly. The surrealistic prices of the original vinyl recordings given by the Western dealers invited him to track down records from sellers all over the world and contact the non-insane sources. As a chronic buyer juggling with the time zones, record dealers got used to e-mail him before they list their records on line. In 2005, he started posting songs on his website - a kind of a "look-what-I-got-here" sort of thing. He thought at the beginning "who care about this stuff? ", but apparently there are more than a few people who did... He makes us happy! Furthermore inadvertently, thanks to his initiative, he made contact with those "who put out some of the compilations that helped start this insanity in the first place" and shares since a while the benefits of their kept treasures. Now as templates do exist to make his on line process easier and after much pestering and prodding due to technical issues, Stuart keeps on gathering all his posts on Radiodiffusion Internasionaal Annexe. Let's travel! "I've never really had a plan when I started this. Still have no clue what I am doing... I've even had friends try to talk me out it. But April 2008 saw the release of the Bollywood Steel Guitar compilation that I assembled for Sublime Frequencies, which happened practically by accident. Then in 2011, Pakistan ⋆ Folk and Pop Instrumentals 1966 - 1976 was released. Will there be more projects? Who knows?"